Classic Grills Renaissance Round White Bronze Grill Discounts Apply ! Classic Grills stunning round return grilles are constructed with 1/4" solid white bronze that resembles a brushed nickel finish. Custom vent covers feature a beautiful scrolling pattern that will match with many home and businesses decors. 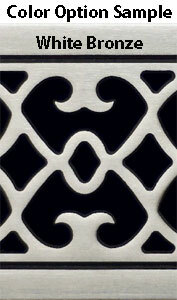 The round return grilles are very strong since they are manufactured 1/4" thick solid white bronze. Circular custom vent covers have a screen affixed to the back to catch small items that may sneak through the grille of the round return grilles. Measure for your circular custom vent covers by the diameter across the round vent hole in the wall or floor. Do not use the diameter of the current grille to place your order. Overall faceplate dimensions of this return air grille cover are approximately 2" to 2 1/2" larger than the interior measurements. Example: 8" round return grilles will fit circulars vent hole opening measuring 8" across. 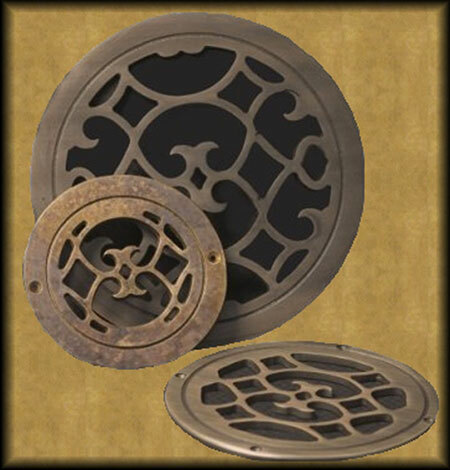 Classic Grills circular custom vent covers will be manufactured once your order has been received. Special order and are not returnable and cannot be canceled once payment is received. Lead time is 7 to 9 weeks to be manufactured. White bronze round return grilles come with screw holes for mounting, unless you ask for no screw holes in the comments section of your order at checkout. You are always welcome to place your order with us over the phone as well. Round return grilles will have a screen affixed on the back which is not pictured above. We also have rectangular custom vent covers and rectangular custom registers made of white bronze to match these circular custom vent covers. Looking for other styles of custom vent covers? Classic Grills has a variety of patterns available. Heads will turn when people see these beautiful white bronze round return grilles in your home or business.